Richard Ray Whitman is an internationally acclaimed artist and photographer. His work has been exhibited at museums and galleries nationally, internationally and locally - with highlights including the Artrain nationwide tour, and a solo exhibit at the Smithsonian's National Museum of the American Indian Heye Gallery in NY. His work has been published in magazines including Native Peoples and American Indian Art, and featured in books including Aperture's Strong Hearts. As an actor, he has appeared in movies including Lakota Woman, American Indian Graffiti, and the award-winning Oklahoma production Four Sheets to the Wind. Whitman previously participated in the Artist in Residence program from the late 1980s through the 90s, completing residencies in numerous public and alternative schools statewide. Prior to his work with the Oklahoma Arts Council, Whitman taught art through the Indian Youth Council and the youth at risk program at the Native American Center in Oklahoma City. Whitman has also worked with youthful offenders, teaching art as rehabilitative therapy as a visiting artist in several state corrections institutions. As a Yuchi tribal member, he is enrolled in the Muscogee/Creek Nation. 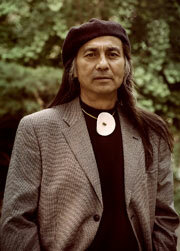 He grew up in Gypsy, OK and graduated from the Institute of American Indian Arts in Santa Fe, NM in 1970.